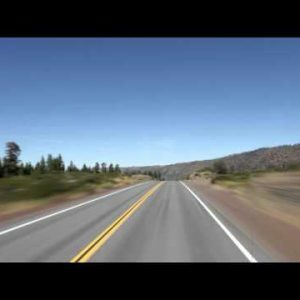 Highway through field and trees - Stock Footage, Inc. Tags: asphalt, auto, barren, beautiful, beauty, california, canada, countryside, drive, driving, empty, environment, fast, forest, freeway, fresh, green, highway, horizon, landscape, lane, mountain, national, natural, nature, outdoor, outdoors, park, peak, pine, road, rocky, route, rural, scene, scenery, scenic, sky, summer, tourism, traffic, transportation, travel, tree, trip, valley, view, wood, woods. Driving down straight highway surrounded by field of weeds and pine trees.